Seemingly simple, the distance between the questions is massive, made wider by Christology, pneumatology, eschatology and Biblical hermeneutic. Simple questions are seldom simple. More than anything, nationalism has overpowered Christianity in many people and in many churches. Nationalism is where the symbols of religion and government intertwine and become more important than the philosophies behind them. Nationalism helps you value the country’s flag over people. As some American Christians moved away from the values behind the words, and simply worshiped the pages of the Bible, it grew easier to prioritize tax cuts for the wealthy over programs for the poor. Nationalist Christians seem to care more about abortion, than about the health of living women or children. They worship a false Christianity of their own creation and outright reject the actual teachings of Jesus. The gap between the two versions is as different and stark as the people it affects — the powerful rich and the powerless poor. Jesus is on the side of the powerless. The least of us. The weakest. When the actual words of Jesus lose their meaning, people suffer, churches lose their way and Christians leaders become no different than the oppressors of the Empire. Nationalist, Western Christianity becomes an institution for the powerful and not Good News for the poor. 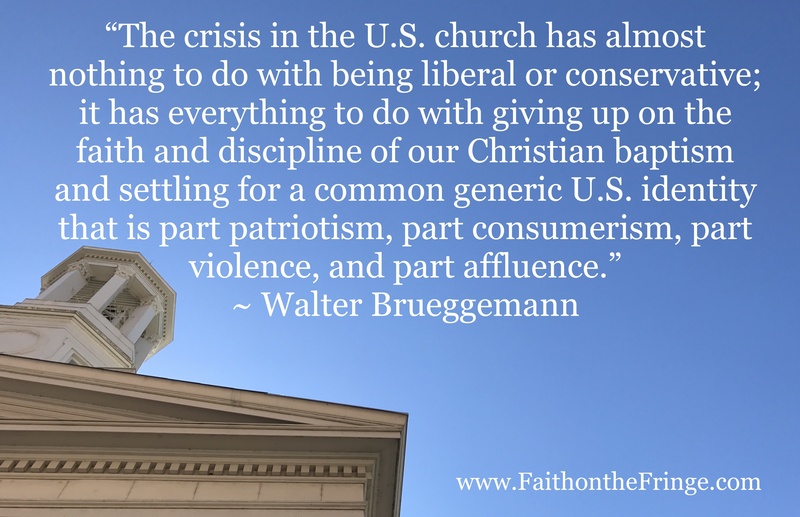 This entry was posted in culture, Faith, Uncategorized and tagged Abortion, American Christians, Christology, eschatology, nationalist Christians, pneumatology, Walter Brueggemann. Bookmark the permalink.